St. Jude Medical, Inc. (NYSE:STJ), a global medical device company, today announced new, two-year data from the ROADMAP ( R isk Assessment and Comparative Effectiveness O f Left Ventricular A ssist D evice and M edical Management in A mbulatory Heart Failure P atients) Clinical Study. Two-year study results were presented today during the International Society for Heart and Lung Transplantation (ISHLT) 36TH Annual Meeting and Scientific Sessions. The study met its primary endpoint of improved survival with enhanced functional status at 24 months in patients implanted with the HeartMate II ™ left ventricular assist device (LVAD) compared to optimal medical management (OMM) highlighting the benefit of the HeartMate II LVAD. Furthermore, survival with improved functional status, quality of life (as measured by EQ-5D Visual Analog Scale), and reduced severity of depression with HeartMate II LVAD compared to OMM at two years. The ROADMAP study was a prospective, multi-center observational study of 200 patients that evaluated the effectiveness of the HeartMate II LVAD compared to OMM in a patient population not dependent on inotropic medications (medications that alter the force of muscular contractions). Seventy percent of the HeartMate II LVAD patients survived at two years, compared with 41 percent of those treated with medications alone (medically managed patients) on an as-treated basis. At two years of follow-up, 30 percent of patients in the HeartMate II LVAD group versus 12 percent of patients on OMM, met the primary endpoint of survival on the original therapy along with a 75 meter increase in six minute walk test distance (6MWD), a difference, which was statistically significant (p=0.012). These benefits were apparent even though the LVAD cohort was more severely ill, with 65 percent of HeartMate II LVAD patients compared with just 34 percent in the medical management group designated as INTERMACS profile 4 at baseline. "The ROADMAP study shows that LVAD therapy is a treatment option for advanced heart failure patients not yet on inotropic therapy. Patients who desire to improve their quality of life and functional capacity may choose the option of LVAD before they become hospitalized and more critically ill," said Dr. Randall C. Starling, professor of medicine at the Cleveland Clinic. "It is important that referring physicians refer advanced heart failure patients early so they may learn more about their treatment options and fully understand and appreciate the risks and benefits associated with getting an LVAD. Patient decision making is preferable when they are ambulatory versus hospitalized and critically ill."
Mechanical circulatory support (MCS) is a proven therapy for treating patients in the most advanced stages of heart failure. The majority of LVAD implants are performed in patients who are dependent on inotropic medications. Though indicated for HeartMate II LVAD therapy, less than 20 percent of patients in the INTER agency Registry for M echanically A ssisted C irculatory S upport (INTERMACS), are non-inotrope dependent. "We continue to see positive results from the ROADMAP study and are pleased these data provide confirmation of the importance for physicians to educate patients about early intervention with LVAD therapy," said Dr. John B. O'Connell, medical director for St. Jude Medical. "St. Jude Medical is committed to providing physicians with innovative technologies that treat the world's most expensive epidemic diseases, such as heart failure." Similar to the one year results, two-year survival on original therapy with overall functional improvement significantly favored HeartMate II LVAD support as measured by changes in New York Heart Association (NYHA) classification. Within the LVAD group, 48 percent of patients at two years improved at least one NYHA Class compared with only 13 percent in the OMM group. Quality of life metrics also favored HeartMate II LVAD despite the fact that adverse events in total were higher than with medical management. There is a trend for a reduction of adverse events in year two for the LVAD group. Additionally, 30 day mortality within the LVAD group was only one percent, which is equivalent to optimal medical management. There were 23 patients originally in the medical management arm who received an LVAD during the two year follow up period. Although this group of patients is referred to as the "delayed" LVAD group in the study, approximately half of them were implanted in INTERMACS profile 4-6, which is still earlier than when the average patient is implanted. The study found that delaying the LVAD implant did not increase mortality; the opportunity to improve quality of life and functional status is delayed with OMM. 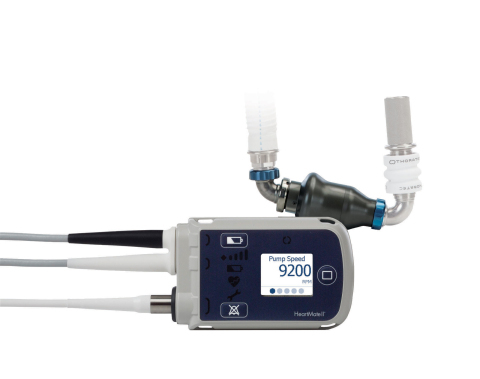 About ROADMAPThe ROADMAP study was designed to examine the effectiveness of HeartMate II LVAD support compared with OMM for NYHA Class IIIB and IV patients categorized as INTERMACS profiles 4 through 7 and not dependent on intravenous inotropic support. The study enrolled 200 patients at 41 sites from October 2011 through July 2013, including 97 patients in the LVAD support group and 103 patients on optimal medical management. About St. Jude Medical's Heart Failure BusinessSt. Jude Medical is pioneering heart failure disease management with innovative solutions like the CardioMEMS ™ HF System, ground-breaking quadripolar technology, our first-to-market MultiPoint ™ pacing technology and, in select European markets, the HeartMate 3 ™ left ventricular assist system. St. Jude Medical collaborates with heart failure specialists, clinicians and advocacy partners to provide innovative, cost-effective solutions that help reduce hospitalizations and improve patient quality of life for heart failure patients around the world. Information for patients to learn more about heart failure can be found at heartfailureanswers.com.